Olivia de Havilland and Errol Flynn in Dodge City (1939). This movie is airing Wednesday on TCM. It's another great week on TCM. 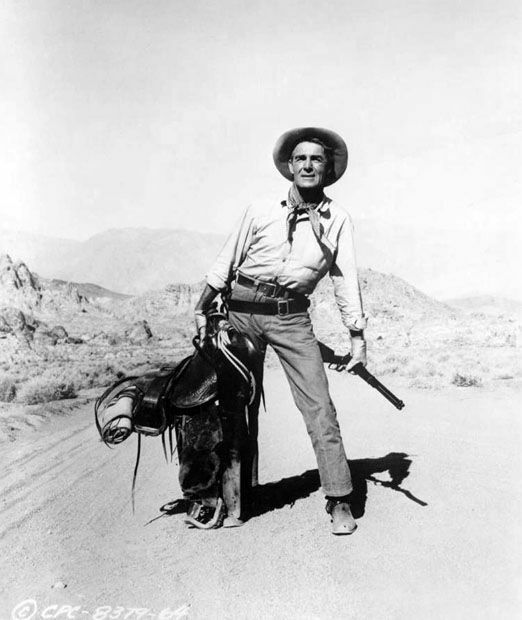 There's three of star of the month William Holden's best movies airing Monday night, an Errolivia marathon on Wednesday night, and some of the best Randolph Scott-Budd Boetticher Westerns on Friday. Note: All times are ET and the highlighted text has links to full-length articles. Here's a link to the complete schedule for April 9-April 15. 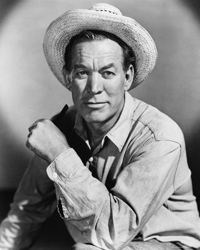 One of old Hollywood's most prolific and beloved character actors, Ward Bond was born April 9, 1903, in Benkelman, Neb. Bond met John Wayne while they were both playing football at the University of Southern California, and the lifelong friends appeared in 23 films together including the John Ford-directed Western Fort Apache (1948) at 7:30 am and the submarine movie Operation Pacific (1951) at 1:15 pm. Other great Bond films airing Monday are the underrated The Fugitive (1947) at 3:15 pm (Bond plays an outlaw who befriends wanted priest Henry Fonda) and the noir On Dangerous Ground (1952) at 6:30 pm (Bond goes on a manhunt with brutal cop Robert Ryan). William Holden and writer-director Billy Wilder made four films together. TCM is airing two of those movies on Monday as part of Holden's star of the month tribute. 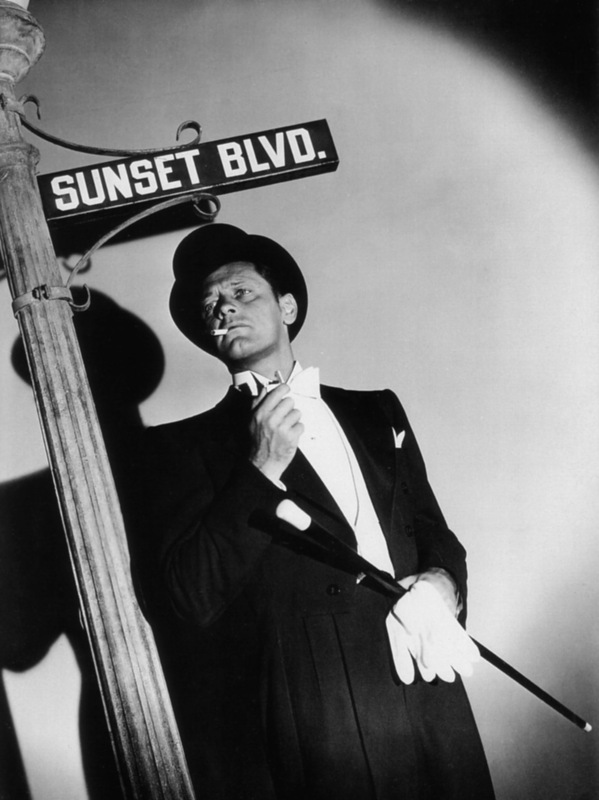 First up is the all-time classic Sunset Boulevard (1950) at 8 pm. 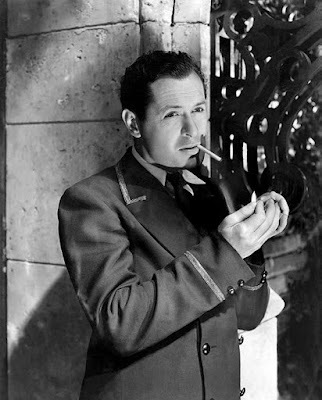 Holden had been kicking around Hollywood for about a decade before Wilder cast him as down-on-his-luck screenwriter Joe Gillis, but his performance in this film made him a superstar. Holden won his only Academy Award for playing a cynical World War II sergeant in Stalag 17 (1953) at 10 pm. The Bridge on the River Kwai (1957) at 12:15 am Monday night/Tuesday morning: This World War II drama about the building of a bridge at a prisoner of war camp was one of old Hollywood's first true action blockbusters. It still holds up exceptionally well today, especially the performances of Alec Guinness as a stubborn British colonel (he earned every inch of his Oscar and then some) and Sessue Hayakawa as his equally stubborn Japanese counterpart (he was nominated for an Oscar but unfortunately didn't win). Star of the month Holden has a great action man part as an escaped POW who returns to the camp on a sabotage mission. Jane Powell is an old Hollywood icon for her roles in Royal Wedding (1949) and Seven Brides for Seven Brothers (1954), but in the late 1940s and early 1950s she was a popular star of lightweight teen musicals like Two Weeks with Love (1950) at 8 pm Tuesday, A Date with Judy (1948) at 10 pm, and Nancy Goes to Rio (1950) at 2 am. 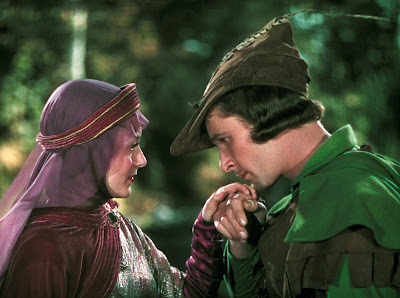 Olivia de Havilland and Errol Flynn in The Adventures of Robin Hood (1938). TCM's spotlight on director Michael Curtiz is bringing viewers a marathon of movies starring Olivia de Havilland and Errol Flynn or, as they are known on social media, Errolivia. 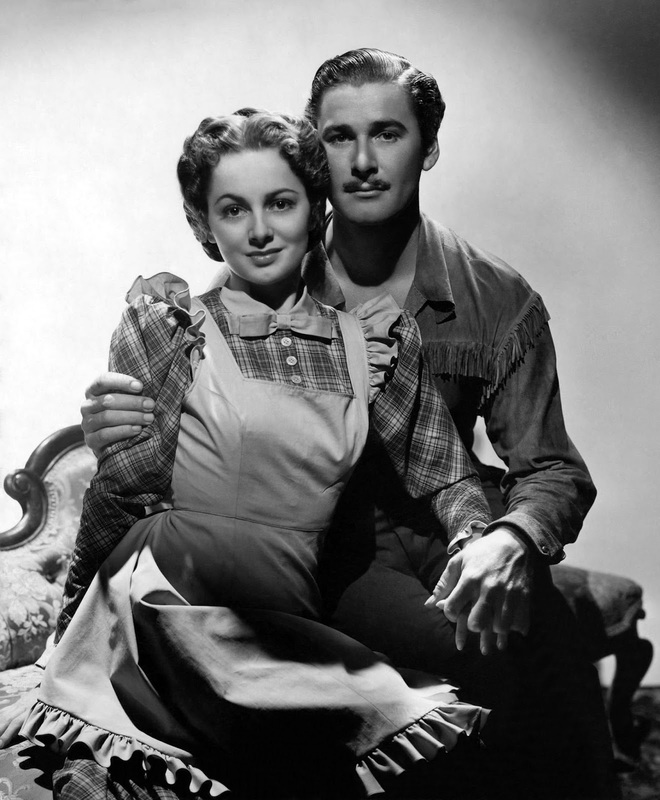 The lineup starts out at 1:45 pm Wednesday with perhaps the oddest Errolivia movie, Santa Fe Trail (1940). It's a great movie, but no one even goes near the Santa Fe Trail; Instead, Flynn and Ronald Reagan chase abolitionist John Brown (Raymond Massey) all over pre-Civil War Kansas. Next, de Havilland and Bette Davis (as Queen Elizabeth I) are romantic rivals for Flynn's affections in The Private Lives of Elizabeth and Essex (1939) at 6 pm. The prime time lineup features the great swashbucklers The Adventures of Robin Hood (1938) at 8 pm and Captain Blood (1935) at 10 pm. The Western Dodge City (1939) at 12:15 am and the adventure film The Charge of the Light Brigade (1936) at 2:15 am round out the evening. Not Errolivia, but still great: The pirate film The Sea Hawk (1940) at 4:15 am is one of the most exciting of the Flynn-Curtiz collaborations. Brenda Marshall takes over leading lady duties from de Havilland in this film. Night Must Fall (1937) at 6 pm Thursday: Robert Montgomery received his first Oscar nomination for his role in this murder mystery. He both plays off of and subverts his nice-guy image as a charming Irish servant who may be responsible for a series of deaths in a small English village. Rosalind Russell gives a great performance as the young woman who investigates Danny. More murder mysteries: Night Must Fall is part of TCM's daytime lineup of murder mysteries. Four of the films concern newlyweds whose husbands may be out to do them harm. First up is Barbara Stanwyck and Humphrey Bogart in The Two Mrs. Carrolls (1947) at 9 am followed by Ingrid Bergman and Charles Boyer in Gaslight (1944) at 12:15 pm. Next there's Joan Fontaine and Cary Grant in Suspicion (1941) at 2:15 pm and Katharine Hepburn and Robert Taylor in Undercurrent (1946) at 4 pm. 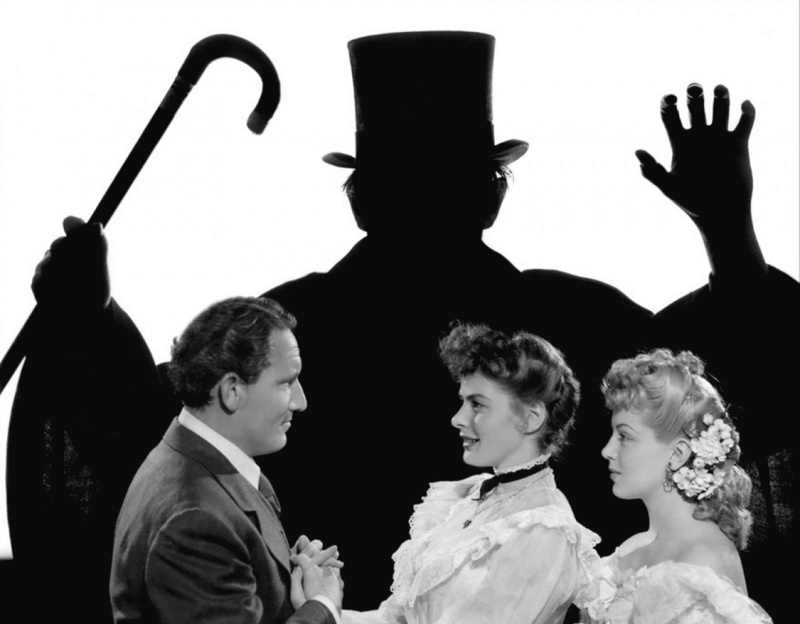 Spencer Tracy, Ingrid Bergman, and Lana Turner in Dr. Jekyll and Mr. Hyde (1941). Dr. Jekyll and Mr. Hyde (1941) at 8 pm Thursday: TCM is airing the 1941 version of Robert Louis Stevenson's classic tale as part of a night of films about Victorian scientists. I wrote about several old Hollywood versions of Dr. Jekyll and Mr. Hyde for the Movie Scientist Blogathon. Here's the link to the article. Another Great Scientist: Rod Taylor transports himself into the future in the fun H.G. Wells adaptation The Time Machine (1960) at 3:15 am. 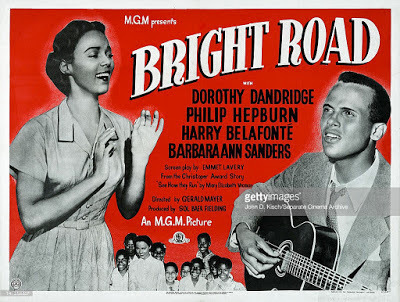 Bright Road (1953) at 9:45 am Friday: My fellow Classic Movie Blog Association member Patricia Nolan-Hall chose this idealistic drama about a rural school starring Dorothy Dandridge and Harry Belafonte as her TCM pick for April. You can read her wonderful article here. Bright Road is part of a daytime lineup about minorities on screen. More great movies: Legends like Lena Horne, Duke Ellington, Ethel Waters, and Louis Armstrong make Cabin in the Sky (1943) at 8 am a must-watch musical. The urban drama The Blackboard Jungle (1955) at 12:15 pm features old Hollywood icon Sidney Poitier in a pivotal early role. The noir Edge of the City (1957) at 4:15 pm has another great early Poitier role as a dock worker who fights corruption. TCM is airing three of the best Westerns made by director Budd Boetticher and actor Randolph Scott on Friday night: The Tall T (1957) at 8 pm, Ride Lonesome (1959) at 9:30 pm, and Decision at Sundown (1957) at 11 pm. 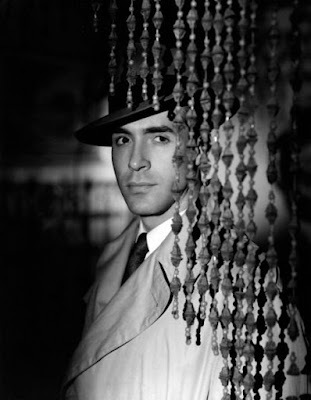 Mystery Street (1950) at midnight Saturday night/Sunday morning and 10 am Sunday: Detective Ricardo Montalban and Harvard scientist Bruce Bennett team up to solve a cold-case murder on Cape Cod. This noir has a CSI Boston vibe because of its location shooting in Massachusetts and its focus on forensic science. Margaret Rutherford, Bill Travers, and Virginia McKenna in The Smallest Show on Earth (1957). The Smallest Show on Earth (1957) at 8 pm Sunday: This British comedy is about a married couple (real-life spouses Virginia McKenna and Bill Travers) who inherit a shabby movie theater known as "the flea pit." 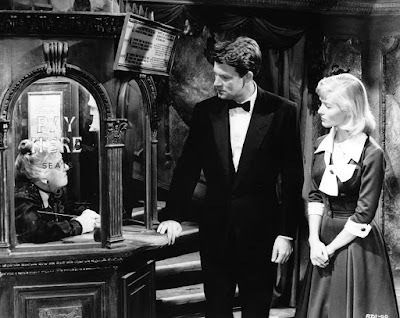 This film is not that well known to American audiences, but it has a lot of charm, especially the performances of Margaret Rutherford, Peter Sellers, and Bernard Miles as the eccentric theater employees. More McKenna and Travers: The couple became animal rights activists after making Born Free (1965) at 10 pm Sunday, about a family who raise three orphaned lion cubs. 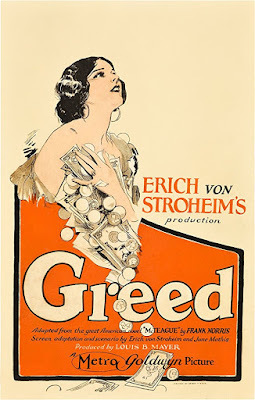 Greed (1924) at midnight Sunday night/Monday morning: TCM is airing director Erich von Stroheim's epic about the power of money to ruin people's lives. Von Stroheim's original film ran eight hours, but it was heavily edited by MGM executives. 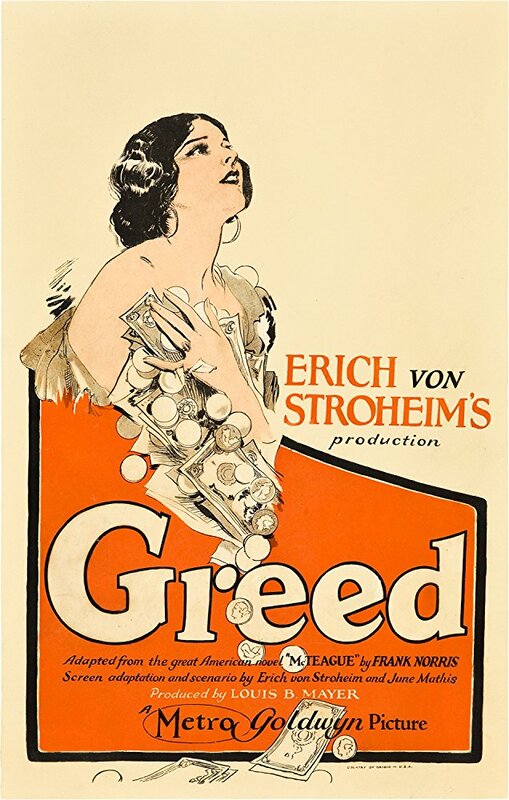 Greed has since been partially restored, but it looks like TCM is airing the two-hour version. At whatever length, it's almost unbelievable to me that all of the movie's sturm und drang is caused by a $5,000 lottery ticket (this was a much more substantial sum in 1924 than it is today, but, still, the characters in this movie have zero chill). What a marvelous week where fans are spoiled for choices and the only thing holding us back is the obligations of real life. Your performance of the week could not be more perfectly chosen. Robert Montgomery and Dame May Witty are outstanding, although I feel that word may be putting it mildly. I hope those who have yet to experience the charm of Bright Road will give it a chance. Sadly, TCM Canada does not have the rights to The Smallest Show on Earth. My sister and I once spent agonizing hours trying to remember the name of that movie. I saw on the TCM guide The Smallest Show on Earth wasn't showing in Canada :(. I had a hard time finding it myself because its called Big Time Operators on IMDB and just about everywhere else.